Using a serrated knife carefully slice all the crust off the loaf of bread. You want the entire loaf to be crust free for this recipe. Place the crusts aside for another recipe. Then slice the loaf along the long side into about long slices. So you should end up with about 7 long rectangle slices of bread, depending on how thick you cut them. 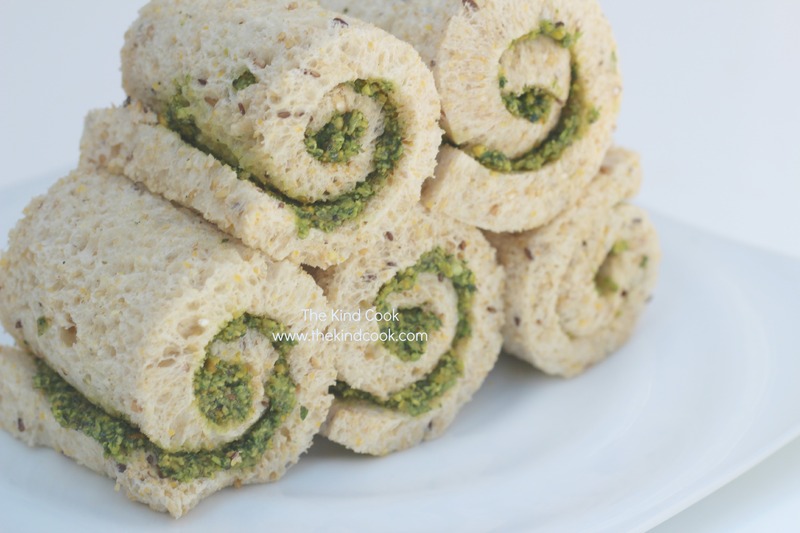 Lay one slice of bread on your bench and spread a thick layer of pesto across the top. Then roll the bread slice from one of the short ends until the whole slice is rolled into a snail shape. Cut the roll into 2 so you end up with 2 good size pin wheels and place aside. Repeat this with all of your sliced bread until you have about 14 pin wheels. These are great for parties and picnics or just a different lunch box idea for the kids. # For a quicker recipe have the pesto made and in the fridge ready to use. You can also pre slice your bread and just keep it over night in an air tight container or sealed in the plastic it came in so all you have to do on the day you want your pin wheels is top , roll and cut them.